Hey, hey, hey! Hazel here, y’all. My lovely co-bloggers have been posting more actively than I have been but I sure hope you guys haven’t forgotten me. It’s so nice to be blogging again and to be sharing some cool news on top of that. You may or may not know this but aside from reading YA, I’ve also been writing YA. I’ve worked on two manuscripts now, still revising the latest one, but for some reason, I can’t quite forget about my first. So today, I’m spilling all the beans about my YA novel. This isn’t a very unique or standout title I admit but I think if you read the story you’ll really understand why this title is the right one. Megan Delaney needs an adventure. At least that’s what her best friend tells her. After a huge academic downfall, going on the road to attend her cousin’s wedding with the groom’s brother, a boy she’s never met, just might be what she needs. Driving two thousand miles to Tennessee will make for amazing content on her blog, but making the trip with a stranger is Megan’s worst nightmare–even when he is terribly cute. It doesn’t help that Zac Mitchell, laid-back boy band member and spontaneous extrovert, is her total opposite. When Zac throws her travel plans out the window of his vintage van, Megan suddenly faces a summer of unexpected detours and exhilarating firsts. But just as Megan steps out of her comfort zone and starts to realize her growing feelings for the boy who helped her break out of her shell, the safe haven that is her blog gets spammed and attacked by fangirls who don’t think she deserves Zac. If Megan wants to open her heart to the greatest adventure of all–love–she must first find courage and confidence in herself. I love designing and I often obsess about beautiful book covers. So while I wrote What Happens Now, I wanted to create a book cover that allowed me to hope for the best (that it would one day be a real book with a real cover) and inspired me to keep on writing. 2015 was one of the best years for this blog and for me personally. One of the best things that happened that year was finishing this manuscript hands down. And it all started with a silly dream featuring Harry Styles. While I’m as addicted to his newest song as everyone, I wasn’t exactly his biggest fan. So it was weird for me to dream about him. But somehow that made me think what if and it spurred me to write this book so I guess I should appreciate him more. I started writing this during Camp NaNoWriMo and surprisingly enough, I made it to the finish line two days earlier than expected and had time to let the draft go beyond the usual 50k words. Finishing my first draft in 23 days was quite the feat for me so I wrote about how I did it in a previous blog post. I knew the moment I started writing this story that I wanted to add a few things to the format to make it special and more realistic. So I worked on a whole different blogging voice for my blogger MC and wrote a few verses of songs for Passive Aggressive, the fictional boy band featured in my story. I think one reason I can’t let go of this book is that I still keep listening to my writing playlist for it. It’s just a mix of some of my fave music that represents the story so much and every time I listen, the whole story comes back to life for me. Listen to the playlist and get a vibe of the romance and growth in What Happens Now! Just watch this super fun video and listen to the lyrics and you’ll get the vibe and plot of What Happens Now! Also, I could totally see Bridgit Mendler as my protagonist, Megan. And yes, that’s her on the book cover! She and her now ex-boyfriend Shane Harper were actually my inspiration for my main character and her love interest, Zac! This was not inspired by the musical, I swear. I just used a random name generator, which is an actual feature in Scrivener. Like I said, I wrote this in 2015 and I don’t think I knew about the Hamilton musical until 2016. I’ve never revised a book before this one, mostly because I’ve never had a book to revise until I finished writing What Happens Now. I discovered a lot of strategies while revising it but I also learned my own process for revision and what works for me. Querying was a hard process. Don’t get me wrong, I love it because I learned so much. But it wasn’t exactly easy for my heart. I still think a lot of good came out of my querying journey for What Happens Now though. Check out these fun stats! You can now read What Happens Now! If you follow me on Twitter, you know I’ve been considering submitting my manuscript to Swoon Reads. In fact, I did a poll and since around 100 people (from a poll of 113) said they’d be interested in reading, I finally submitted my manuscript! 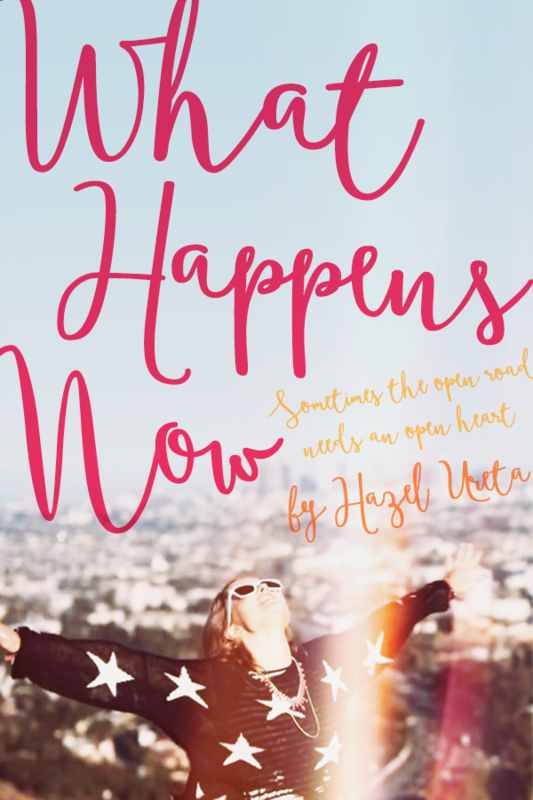 So if you like road trip adventures, music, and romance, read What Happens Now on Swoon Reads and don’t forget to tell me what you think by giving it a rating and leaving a comment on the Swoon Reads website! What do you think of What Happens Now? Will you be reading it on Swoon Reads? Do you write YA too? I want to know! PS: I plan to start talking about my writing life more often, especially as I keep working on my second YA manuscript. Watch out for those updates on my personal website, HazelUreta.com! I adore this mock cover, Hazel! <3 And I'm at once proud and inspired by your passion and hard work ethic. Also, totally seconding Becky on your pitch! Okay, I checked this post out for the cover alone but it sounds like a great read. I have a long weekend and I am putting this book on my TBR because it sounds like it’s fun. Also, looking at the pinterest board helped because boy do I love a good pinterest board. Congrats on finishing and can’t wait to get started! Holy crap, Hazel! Congratulations! I will definitely try to squeeze this onto my reading list this year. it sounds very, very cute. Road trips, band boys, rabid fangirls. You got me hooked. How exciting! Does this sound awesome or does this sound awesome? Neither, THIS IS AWESOME, I just know it is. Romance, Blogging, Fangirling, Lyrics, this just seems like a perfect summer read! Awesome! The cover looks so lovely, and the synopsis sounds so fun! Perfect for a summer read. And, how have I never heard of Swoon Reads until now? It sounds like an incredibly helpful site. I’m setting up an account now so I can check out your book! How exciting! I wish you the best of luck. I hope to one day submit my own novel to Swoon Reads. I will have to head over to check out your book!